This winter, add a little soothing moisture to the cold dry air and in total style with this cool new Broksonic Hybrid. 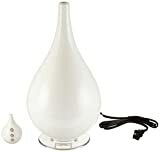 This sleek modern sculptural appliance fuses a whisper quiet, ultrasonic cool mist humidifier with an aromatic essential oil diffuser. A great example of form meeting function on your nightstand at home or desktop at work.